Most aquarists are accustomed to aquascaping with traditional aquarium plants, collectively known by biologists as aquatic macrophytes. We all are familiar with sword plants, Vallisneria, Anubias and crypts. By a new type of aquatic plant is taking center stage in the planted aquarium world. 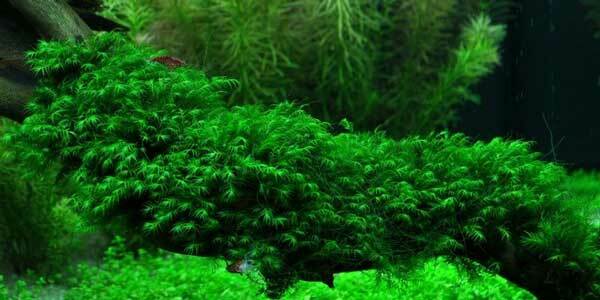 Aquarium moss offer a whole new way to aquascape a freshwater aquarium. Some aquarists use aquarium moss alongside traditional plants. Others use moss exclusively, creating a surreal or bonsai effect with drift wood and other “sculping” structures. These tiny plants help control algae by removing nitrate, phosphate and other nutrients from the water. Want to know more? We’ve compiled a list of the best aquatic mosses along with what you need to know to create your own moss paradise in your aquarium! The true and original Java moss is (Vesicularia dubyana) is sometimes confused with Taxiphyllum barbieri, a similar-looking moss. 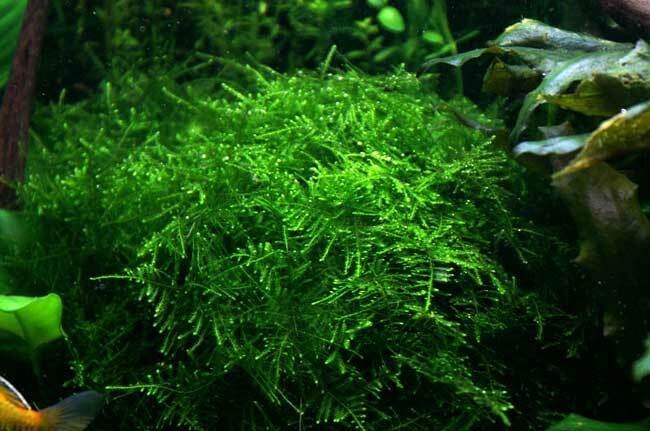 Java moss is one of the most common and familiar of the aquarium moss catagory. 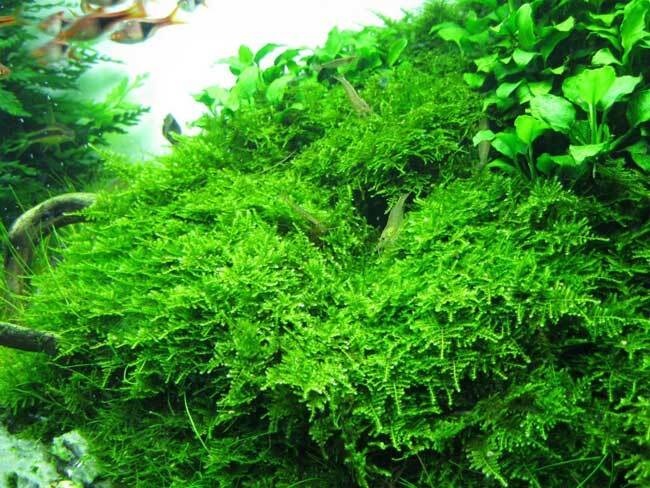 Java moss is native to South-East Asia. It is actually a terrestrial moss, but will grow under water. It grows well even in low light and is not demanding about water conditions. T. barbieri will form a carpet on the bottom of the aquarium. You can attach pieces of the moss to driftwood or stone with black thread. It won’t be long before the moss will begin to attach and grow on its own. 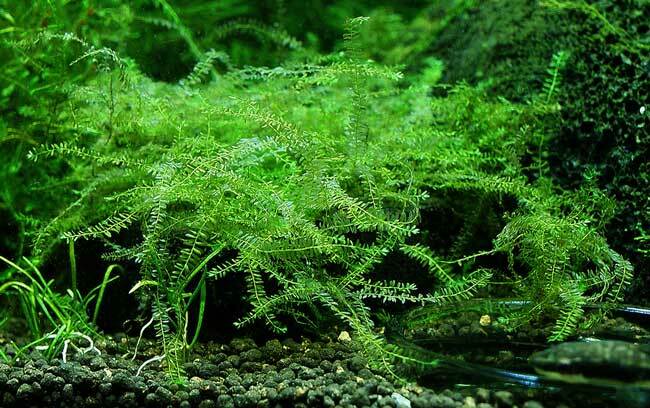 Java moss is a slow grower but can become aggressive in aquariums with carbon dioxide fertilization and brighter lights. This moss should not be allowed to form thick matts. Dead layers underneath will eventually rot. Frequent pruning is required to maintain the shape and a healthy plant density. This moss responds well to heavy pruning. 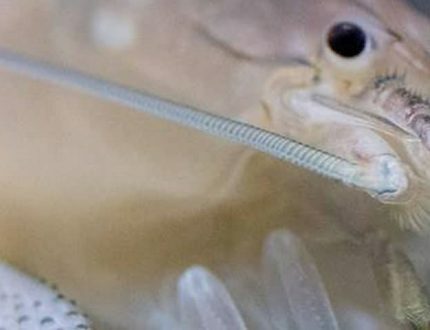 Fissidens fontanus is a native of North America and a favorite food of the trumpeter swan. Phoenix moss is delicate and feathery. The moss forms clumps of leafy stems up to 5-inches long. They can appear light green to darker olive green. Phoenix moss is a slow grower, requiring bright light. It likes water movement too. This moss will attach to driftwood and rocks. Thread can be used to attach the moss the solid surfaces. This moss normally does not need pruning. 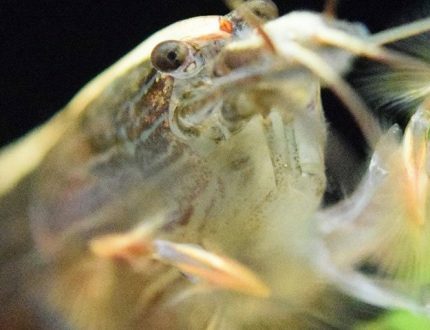 Some aquarists have observed damage caused by liquid carbon dioxide fertilizers. 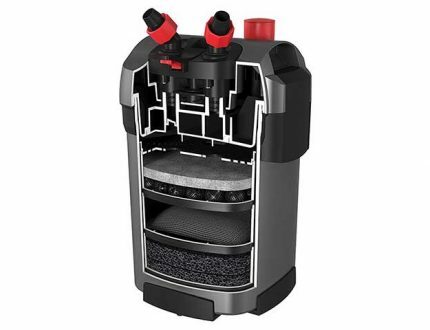 CO2 injection is advised if strong growth and nutrient removal is desired. Vesicularia montagnei is a native of the Sunda Islands of Indonesia. The name for this moss is related to its growth form. Vesicularia montagnei looks like evergreens or Christmas tree branches. The moss will attach to solid surfaces. Christmas moss seems to look most beautiful when its graceful stems flow over a cave or overhang. This way the sweeping branches conjure up the image of evergreens. Christmas moss enjoys brighter light. Pruning is required to keep the graceful evergreen boughs in check. Moss growers suggest using CO2 injection and light fertilization. Peacock Moss is a generic name for moss in the genus Taxiphyllum. Peacock moss can be confused with Christmas Moss. But a closer look shows that Peacock moss has much softer, velvety texture. This is a light-loving moss that looks best growing on upright driftwood branches. It can benefit from CO2 injection if fast growth is desired. 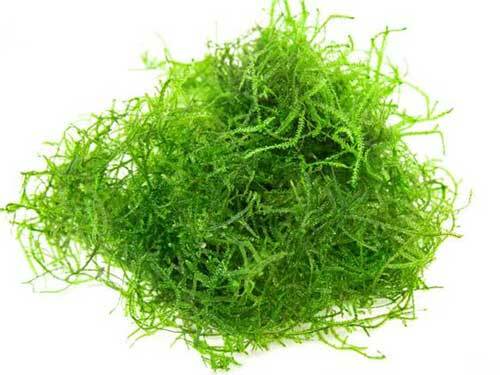 This moss is also a favorite for egg-scattering fish and nano shrimp. Some moss enthusiasts believe this moss is the same as Spikey moss. CO2 injection is advised if strong growth and nutrient removal is desired. Taxiphyllum alternans is native to the southern United States and east Asia. This moss is naturally found growing on rotting trees in swamps and on waterfalls. 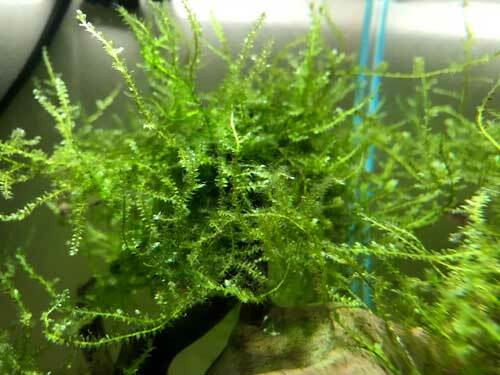 Taiwan moss can appear similar to Java moss. Under bright light the moss will appear very soft and velvety. It can be used as a lush carpet, on driftwood, caves, rock and attached to smooth pebbles. It is slow-grower but undemanding about water quality. Taiwan moss will grow well in stronger currents. Nano shrimp will find this moss an excellent “playground” for exploring. Amblystegium serpens, called nano moss and creeping feather-moss in the aquatic trade, can be found in North America, South America, New Zealand and Australia. It is naturally found on moist soil, rocks and rotting trees. It will grow submerged in aquariums. It’s easy to grow and seems to thrive in an a slightly alkaline pH. 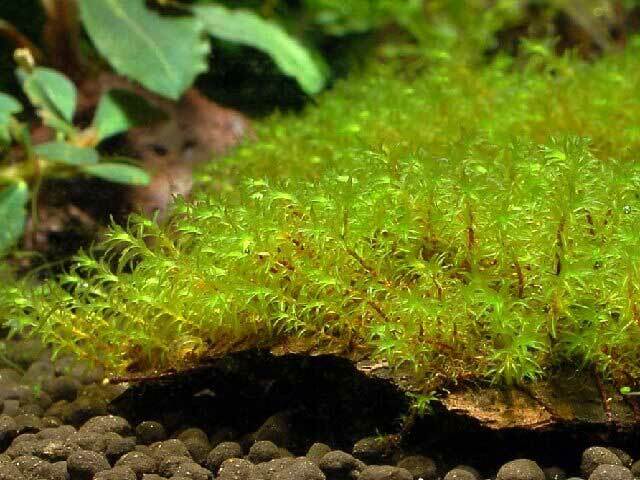 In the aquarium, Nano moss grows slowly, forming dense mats with upright shoots. It tolerates shade and strong lighting. CO2 injection is advised if strong growth and nutrient removal is desired. Barbula species of moss form a soft cushion. It is sometimes called Millimeter moss. This aquarium moss was imported from Asia for the aquarium trade. It has even been found growing in the United States. The mosses are not naturally aquatic in nature but some can be grown submerged in aquariums. The growth habit is a tuft of moss on the bottom of the aquarium. Aquarists are experimenting with millimeter moss to see the best way to culture it in aquariums. It’s a slow-grower so don’t expect quick results. True aquarium moss or mosses that can adjust to be being submerged in an aquarium, are growing in popularity and availability. The knowledge- base for moss grown in the aquarium is expanding based on experimentation by aquarists like you! Fortunately, most mosses are easy to grow and provide a unique look all on their own or used with other live aquarium plants. If you’re looking for an easy plant to grow and reap the benefits of algae-reduction, be sure to give one of these mosses a try!